BTMD Inc. Hardware Design Capabilities. We have several years experience designing custom hardware solutions for a wide range of applications. Our design experience includes both digital and analog hardware design. Below are just a couple examples of boards that we have developed for our sister company nVision Industries. BTMD's general purpose video processor was designed to provide our sister company, nVision Industries, a platform that has the capability to support a wide range of real-time video processing applications. 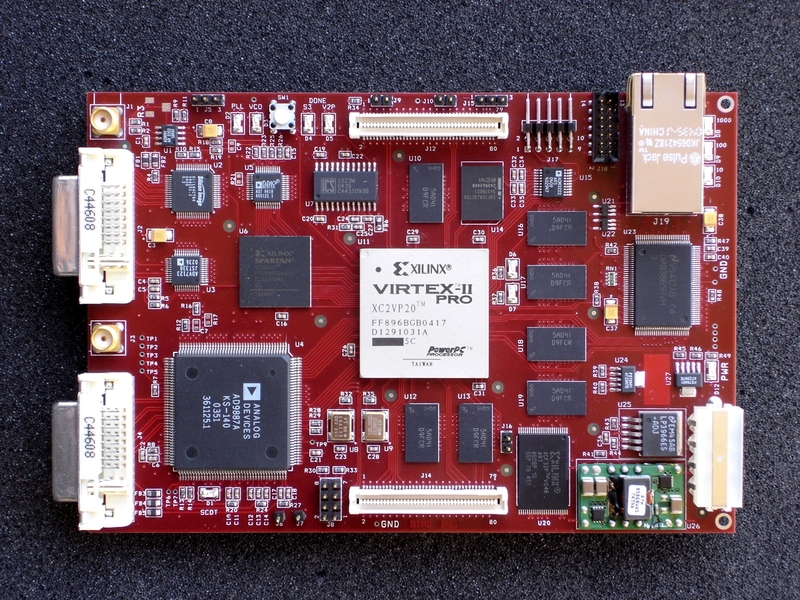 This particular board is based upon the Xilinx-II Pro FPGA processor, and can be easily re-configured to support a wide range of video processing applications. nVision is currently using this board as a simulated NVG video processor and as a RGB to Color Field Sequential video format converter. The board is able to accept both analog and digital video data streams with resolutions up to 1280x1024. The streams can be encoded, processed and output, in parallel, in real-time resulting in a minimum lag. BTMD's General Purpose Video Processor.